This was not Doug's finest day. The Philadelphia Eagles are now 2-2 after what can only be described as a bad 26-23 overtime loss against a less talented team in the Tennessee Titans. As always, win or lose, we hand out 10 awards. 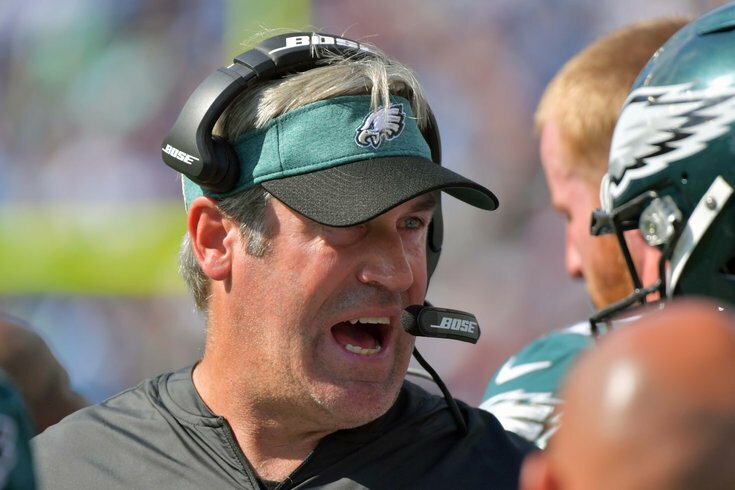 With the ball at the Titans' 10 yard line and 11 seconds left in the first half, Pederson curiously called a run play to Jay Ajayi that went for one yard. The Eagles then called a timeout and kicked a field goal. Naturally, Pederson was asked about that play after the game. His strategy? "Get the first down, burn the timeout, and then have maybe eight seconds left to start taking shots into the end zone," he explained. At that point, my ears started bleeding and I blacked out, so I missed the rest of the press conference. OK, so that didn't happen. Probably. But holy crap, let's not sugarcoat it -- That is a terrible answer. At the time, it was 3rd and 3. Even if Ajayi had a nice run, for, let's say, 5 or 6 yards, they're still calling a timeout and kicking a field goal anyway. There are no three-second running plays. They don't exist. There is no way they were getting off a run play, getting the attention of a referee after the whistles were blown, getting a timeout, and then having time to run another pass play with enough time to kick a field goal if they didn't score, much less several plays as Pederson seemed to suggest when he said they would "start taking shots into the end zone." Good grief. The Eagles are equipped with a trio of good red zone threats in Zach Ertz, Alshon Jeffery, and Dallas Goedert, to go along with a rifle-armed quarterback in Carson Wentz, who was having a great game to that point. I'm personally not one to nitpick play calling (I swear, I'm really not), but that play call was mind-blowing. Again, there's no way to sugarcoat it. Mills' susceptibility to the deep ball is a major liability. In this game, it was mostly Corey Davis doing the honors, though there were others as well. It wasn't just Mills, by the way. The rest of the secondary, with the exception of Malcolm Jenkins, and maybe Sidney Jones, all played poorly. 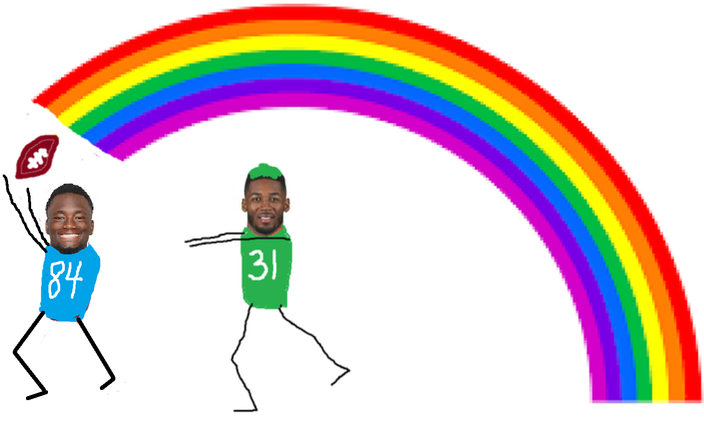 At some point, Jim Schwartz is going to have to consider moving Jones outside, and Mills into another role. Agholor played like it was 2016 on Sunday. He had 5 catches for 22 yards on 12 targets, and at least three drops, at a minimum, four if you count the semi-difficult deep ball that was somewhat off target by Wentz, but could have been caught. The Eagles gained 1.8 yards per pass attempt when they went Agholor's way. Add in a bad Jordan Matthews drop in the fourth quarter, and I'm sure Eagles fans were beginning to have flashbacks. With McLeod likely done for the season with a torn MCL, the Eagles' plan for his deep middle spot was a combination of Corey Graham, and rookie cornerback Avonte Maddox, who said he has never played safety, and only began getting reps there in practice this week. The Titans successfully attacked the deep middle portion of the field all day, something they have not been able to do all season. There's no question the Eagles missed McLeod. And it doesn't just end with the dropoff from McLeod to Graham/Maddox/Whoever. His loss affects almost all of the sub-packages that Schwartz likes to play. If the Eagles were to trade for a guy like, ohhhh, I don't know, Earl Thomas, he could be a significant upgrade on McLeod, and certainly a monumental upgrade over a fourth-round rookie who has never played the position. Just sayin'. Seahawks safety Earl Thomas carted off with a left leg injury. So scratch that plan, I guess. The Eagles are a good defense at home. They're not on the road. I don't think we can chalk that up as a coincidence anymore. It's been a long time since the Eagles just gave a way a game they had in hand, but that's exactly what they did on Sunday. There were multiple times throughout the game in which ESPN's "win probability" tracker gave the Eagles a better than 90 percent chance of winning. They were up over 93 percent after the Eagles went up by 14 points in the second half, and they were up over 92 percent when it was 20-20 in overtime and they were driving, potentially for a touchdown-scoring win. Last season, the Eagles clearly had the best offensive line in the NFL. They haven't been anywhere near as good in 2018. Perhaps some level of dropoff was to be expected, but with a unit returning all five starters, the amount of pressure that the Eagles quarterbacks have faced through four games has been a big surprise. One bright spot was Jeffery, who had a great game in his first appearance of 2018, making eight grabs for 105 yards and a TD. Another bright spot, as always, was Cox. Maddox owes Cox a thank you for his first career interception. Look at Fletch put this LG on roller skates. Cox has been the best player on the team through four games. Some 4th wide receiver (Darius Jennings, but that's not important) dropped a perfectly thrown deep ball from Marcus Mariota, to, guess where... the deep middle portion of the field! And then the Titans converted a 4th and 15 on a play in which a Titans receiver (Taywan Taylor) somehow got wide open on the sideline two yards past the sticks. And then they converted a 4th and 4 on a questionable pass interference call on Sidney Jones. And then Eagles had Tennessee in 3rd and 19, and Marcus Mariota ran for 17 yards. And then the Titans lined up to kick a potential game-tying 50-yard field goal, thought better of it, and instead went for it on 4th and 2, which they converted. And then, you know, they won. There was also maybe a missed block in the back in there as well, but let's not go down the "bad officiating" rabbit hole on this one. The Eagles deserved to lose this game, and they did.